Choux pastry donuts with vanilla ice cream and chocolate sauce. Pre-heat the oven to 220° C. Lightly grease a baking tray. Boil the milk, water, butter and salt in pan. Add the flour and "burn down" to a smooth dumpling, in other words, work through the dough with a cooking spoon and pull over the hot pan base. Remove the dough dumpling from the pan and add to a mixing bowl. Allow to cool slightly then work in the eggs one after the other. When one egg is fully worked in and the consistency is homogeneous, work in the next egg. The easiest way to do this is to use a mixer. Add the dough to a piping bag and squirt the little 5 x 4 crowns at regular intervals onto the baking tray. Place on the middle rack in the oven, pour a little water onto the base of the oven, close the door immediately and bake for 15 minutes. Then reduce the heat to 190°C, bake for a further 15 minutes until the Choux pastry donuts are golden brown. Do not open the oven beforehand. Remove the Choux pastry donuts from the baking sheet. Cut them. Fill each lower half with a teaspoon of vanilla ice cream, place the top half on top. 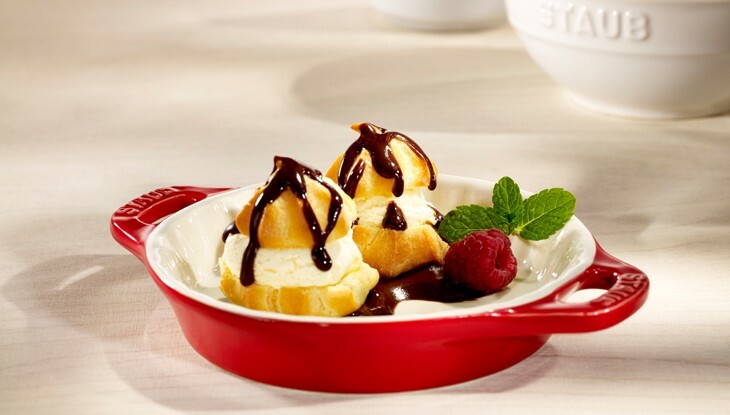 Arrange on plates and pour over the chocolate sauce. Decorate with mint and raspberries.